Gardens putting out the last of the summer veggies. Early fall rains, harbingers of winter coming. We’re happy hyper-locavores relishing a zero-mile-diet along both sides of the Salish Sea. 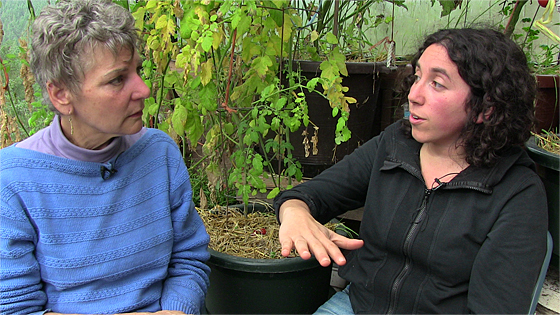 Tasting resilient, close-to-the-earth food cultivation rhythms. Gratitudes to our generous hosts Brian and Alexandra, Inspiration Farm (Bellingham, Washington) and Ann and Gord Baird, Eco-Sense House (Victoria, B.C.). Subscribe to get an email each time we post a blog (perhaps 2 times a week). 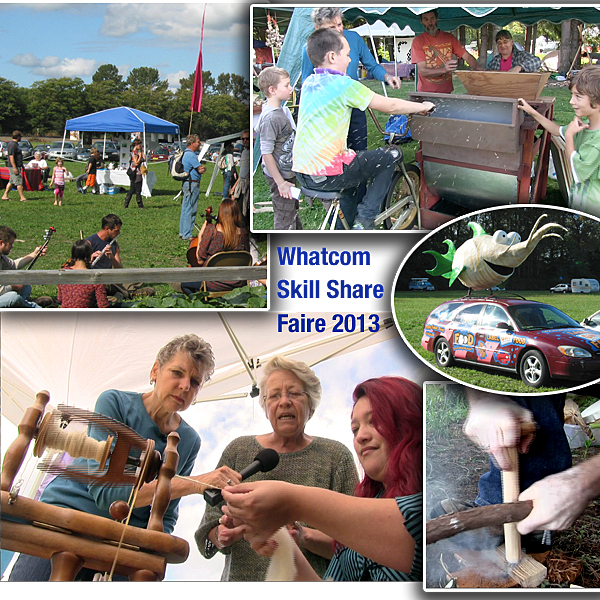 Or befriend us on Facebook to keep up with our adventures. The journey takes us next to Vancouver, B.C. Thanks in advance for your contributions to the Peak Moment Road Trip. Friends Old and New near Bellingham and Victoria, B.C. For the past month our mobile studio/RV has nestled cozily between the kale beds and trees surrounding the compost-heated shower, feeling quite at home in Bellingham with Brian Kerkvliet and Alexandra King of Inspiration Farm – Cultivating Nourishing Food and Creativity (#226). Thanks to friends at New Society Publishers (Planting Seeds for a New Society #207), we learned of PowerShift BC 2013: Youth Gathering for Climate Justice in Victoria, B.C. 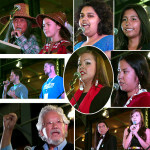 There we videoed David Suzuki’s passionate keynote and were inspired by many indigenous keynoters and dancers. For our ten-day visit to Vancouver Island, Gord and Ann Baird welcomed us to Eco-Sense House (#230) outside Victoria, B.C. 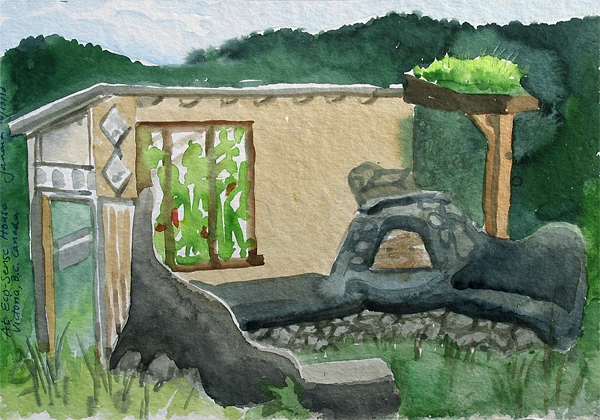 Now they’re building an Eco-Hut and cultivating abundant nook-and-cranny food gardens on their rocky hilltop. David and Angela Macleod of Bellingham prepared us a delicious paleo-friendly brunch, which we all shared along with meaningful conversation with new friends Tom Anderson and Shila Moa. Rainy Hopewell and Margot Johnston of Victoria (Claiming the Commons – Food for All on Haultain Boulevard, #185) introduced us to the nearby “Locavore” local-centric market. Then we shared in their own locavore dinner including veggies from their still-thriving boulevard commons garden. 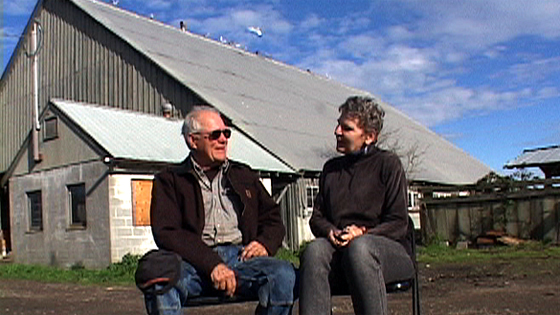 “Farmer George” Vojkovich, who with his wife Eiko manage Skagit River Ranch. 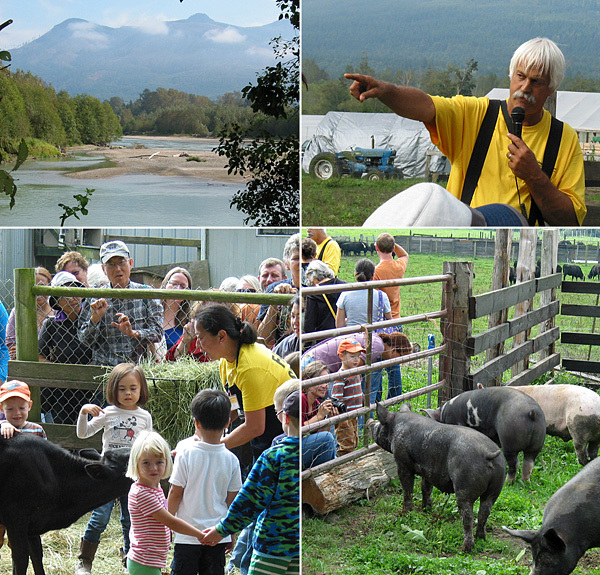 We so enjoyed their Farm Day showing off pastured cattle, pigs, and chickens, that we returned later to video a conversation about his philosophy and practice. Journal: Meet Farmer George and His Pastured Animals. Things are heating up considerably with a rash of climate change reports coming in. Catch Thom Hartmann‘s impressive short video and join his Last Hours campaign. Prof. Guy McPherson is keeping an evergreen tally of climate change self-reinforcing feedback loops. In the video Climate Chaos in Four Minutes, he highlights 23 of the 25 tipping points which appear irreversible. Or read his 19 Ways Climate Change Is Now Feeding Itself. When your city’s new “lowest” temperature is higher than its current “high,” you know you’re in global warming. 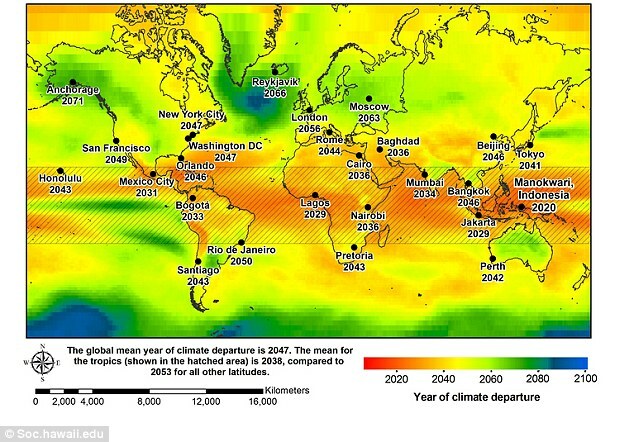 Pictures show predictions for where and when major global cities will experience substantially higher temperatures — the first as soon as seven years from now (2020). How will you be affected? 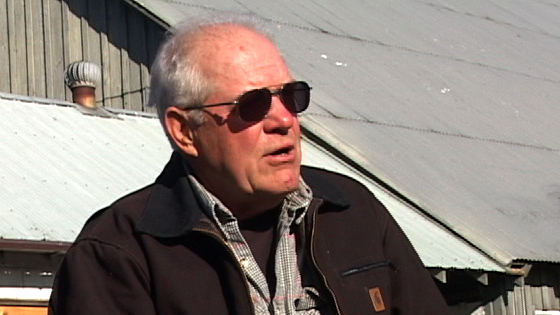 A Longtime Farmer Shares His Wisdom (part 1). Nash Huber is famous for his delicious carrots — crunchy, sweet and alive. He started farming in Washington state’s northeast Olympic Peninsula by cultivating backyard gardens and many relationships. His team grows over 100 varieties of vegetables, fruits, grains, seeds and pork all year round. When suburban sprawl started eating up nearby farmland, Nash dedicated himself to growing a stable base of land for farming. He partnered with PCC Farmland Trust to buy and protect farmland in his region. He was designated Steward of the Year 2008 by the American Farmland Trust. Episode 244. A Longtime Farmer Shares His Wisdom (part 2). For over forty years, Nash Huber has grown healthy plants, soil, seeds — and now future farmers. He nurtures soil fertility with compost, cover crops and chicken tractors. He saves seeds from plants that are best suited to local growing conditions — that’s how he developed his own variety of purple kale. He rotates crops in various plots, so soil can be given a rest and replenish depleted nutrients. As for future farmers, Nash says it takes ten years minimum for young folks to learn how to farm — all hands-on, of course. Episode 245. 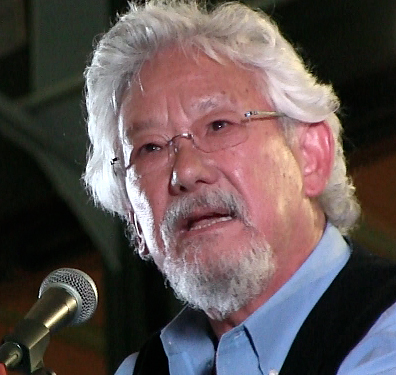 David Suzuki’s Keynote at PowerShift BC 2013. “I come as an elder without an agenda,” were Suzuki’s opening words at PowerShift BC 2013 in Victoria, Coast Salish Territories, B.C. Canada. He closed acknowledging that the indigenous people have what is needed now [a deep connection and passion to protect the land]. Suzuki’s stirring talk was preceded by keynotes from a half-dozen indigenous women. Each laid out the challenges of their land and people against the assaulting onslaught of tar sands, pipelines, coal trains, fracking, human trafficking and more.